The partners at Harris Personal Injury Lawyers serve five locations, ranging from central California down the coast to downtown San Diego. Incepted by managing partner Ryan Harris, the firm aims to provide the same quality care and legal representation to their clients that large insurance companies receive from their lawyers, specializing in cases involving auto accidents, dog attacks, defective products and other injuries caused by the negligence of others. 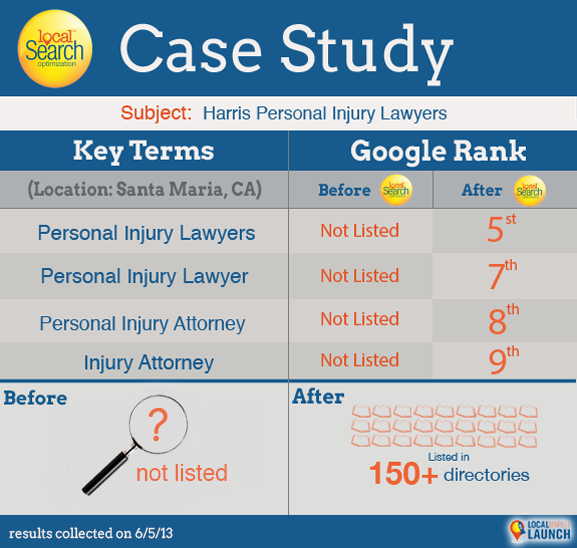 The partners at Harris Personal Injury Lawyers came to us with their newly opened location in Santa Maria,CA in hopes of jumpstarting their web presence in the area. As it was a brand new office, the Santa Maria location was not listed in any directories After working with us for their San Luis Obispo firm in December 2012, they knew we could deliver the fast, tangible results they needed to build local clientele. 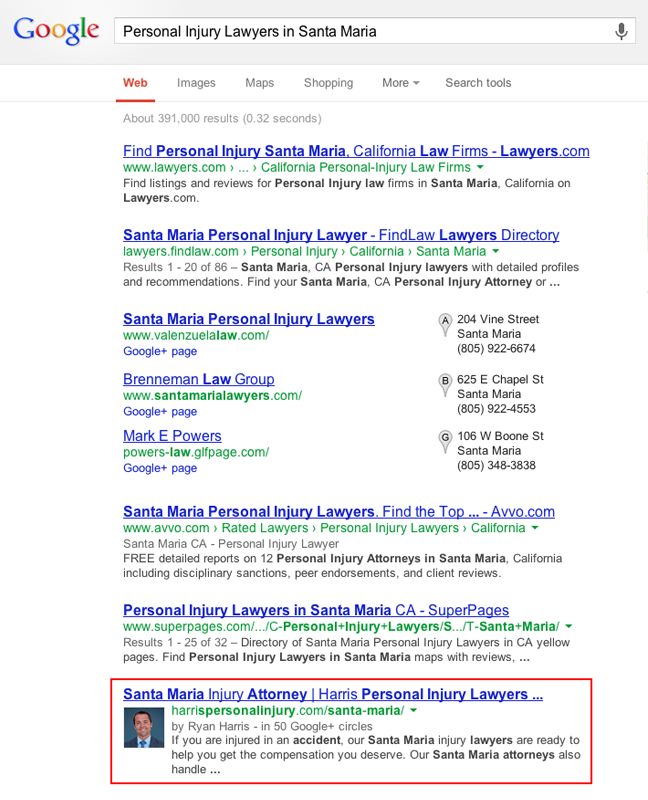 On March 4, 2013 Harris Personal Injury Lawyers submitted an order for the more aggressive local search optimization package. As a multi-location firm in an industry as competitive as legal representation, the partners agreed that investing in stronger online visibility and ongoing expert listings management through LSO was a smart and sustainable marketing tactic. The local search optimization results were substantial, especially considering the Santa Maria location began without any local listings at all. 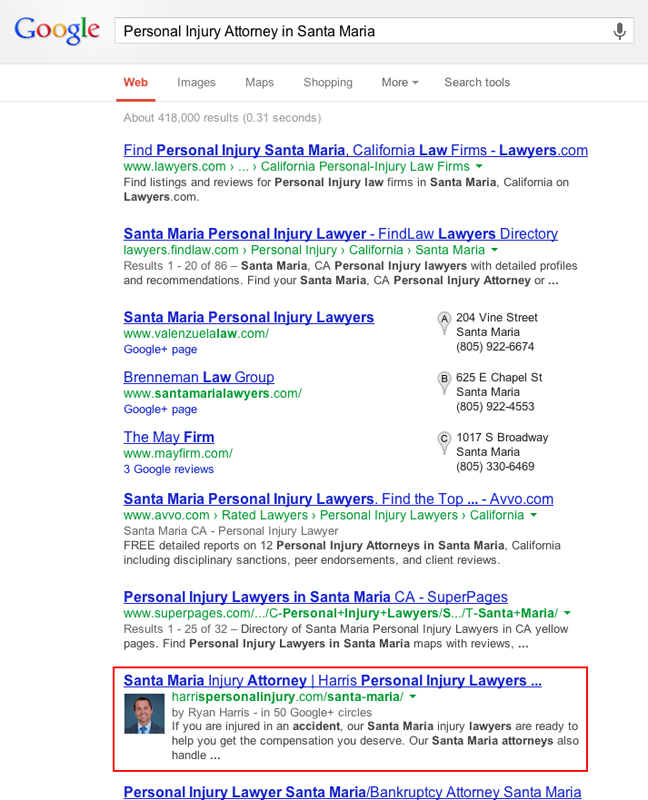 While the Harris Personal Injury Lawyers were once virtually invisible in Santa Maria, after only three months, they are now located on the first page of Google for search queries such as “injury attorney in santa maria, ca” or “personal injury lawyers in santa maria, ca.” As the first page of Google engages nearly 89.71% of all click-through traffic, the Harris Injury Lawyers are in an extremely favorable position to attract interest to their website and secure future clients on the central coast. If you’re a business with multiple locations, it’s extremely important to have all your business information consistent and accurate across all of your online listings. Are you confident with your listings management? Check out our business listings management and local search optimization packages today!